4 bedrooms, 3-1/2 bathrooms, sleeps 10, all year round. 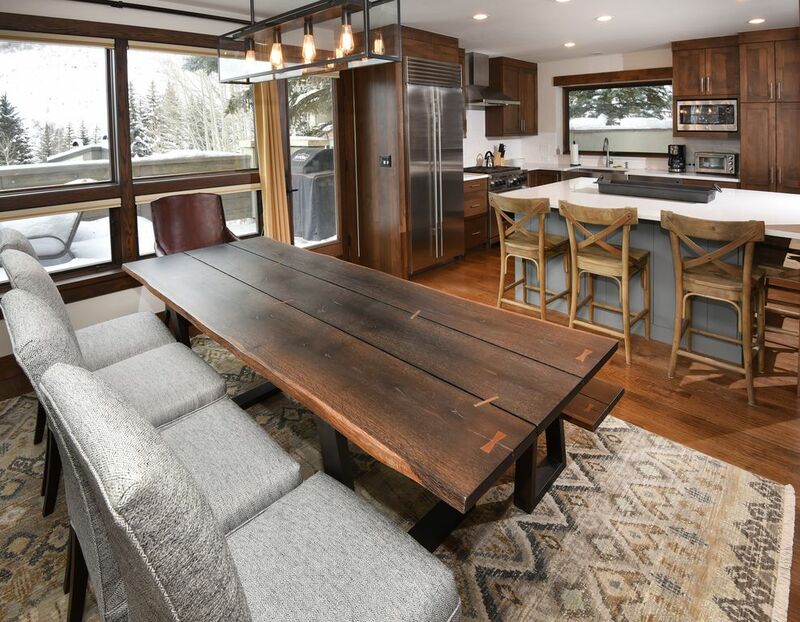 TOTALLY RENOVATED IN FALL 2016, this Magnificent Townhome features amazing panoramic views of Vail Mountain overlooking Lionshead gondola and beyond. New designer kitchen features Subzero and Wolf appliances. New guest bathrooms with in-floor radiant heat and Kohler fixtures. New solid hardwood floors, tile, and wool carpet throughout. The home is 3000 square feet and features a master suite on the top floor with a large seating area, Jacuzzi tub, shower, in-floor radiant heat and walk-in closet. On the lower level, there are 2 queen bedrooms and 2 full bathrooms (1 en-suite) with in-floor radiant heat and a 4th bedroom with bunk-beds and sleeper sofa. Avoid the crowds and bring après ski to your private outdoor hot tub and spacious deck with epic views. Deck overlooks community pool. True indoor outdoor experience. On Free Shuttle Bus route allowing for easy slope access (4-5 minute walk to shuttle, then 5 minutes on the shuttle to pedestrian bridge for Lionshead access or 7 minutes to Vail Village). Or Drive to Vail within 5 minutes; parking is free after 3PM in Winter and free all day in Spring/Summer/Fall. The home sleeps 8-10 people and has 4 bedrooms and 3.5 baths. The home features an open floor plan with kitchen, dining, and living room flowing together on main level. Enjoy wireless internet, 3 TV’s with cable, wood burning fireplace, grill on private deck, private hot tub, and 1 car heated garage for gear, etc. Community heated pool and tennis courts (immediate access from home) are open May – Oct.
Make yourself at home with creature comforts such as new washer and dryer, full kitchen that includes dishwasher, wine glasses, crock pot, electric griddle, and all other essentials. Great for family entertaining with board games and movies. Bedroom #1 “The Retreat”: upstairs master suite is expansive with it’s own living area, ski & mountain views, and TV. The spa-like master bath features radiant in floor heat. Huge walk in closet. Bedroom #2 “The Vail Room”: ski & mountain views, private bath, pull out couch, and outdoor access. Bedroom #3 “The Bike Room”: ski & mountain views, bathroom and shower (adjacent to bedroom), and outdoor access. Bedroom #4 “The Adventure Room”: bunk bed, pull out couch, TV/VCR, perfect for hanging out, movies, and games. Vail offers the largest, most diverse ski mountain in North America; the expanse, terrain variety, and back bowls cannot be beat. Fine dining, great nightlife, and great outdoor fun are all part of Vail year round. Non ski-season offers world-class golf, hiking- North Trail (trail-head adjacent), Piney Lake access road, horseback riding, and Olympic salt water pool, tennis court, pickle-ball courts, and a sports court just below your window. Summer biking is great! Access Vail/Lionshead/Gore Creek Trail from house via pedestrian bridge. Home allows close and easy access to the North Trail system which is great for hiking and mountain biking. Bring your mountain bike or rent one in Lionshead Village. Mountain biking Vail mountain is an awesome experience – the gondola in Lionshead lifts you up to it all! You’ve found the perfect home for up to 10 guests to experience all Vail offers. Condo is beautiful and as pictured. Location is great, views are wonderful, and everything from arrival to departure was nice and smooth. Thank you! The pictures don’t do this house justice! It’s an awesome house with great finishes. The kitchen was fully stocked with all the utensils and items we needed. The master is HUGE! All the other rooms are great sizes too. We traveled with 4 couples. We had one pregnant person in our group so she shuttled us back and forth to vail village- a very short 6 minute drive. One day the road conditions were bad so everyone took the shuttle at the end of the road to and from and it was super easy and convenient! Probably could have just done the shuttle the whole trip. Alan was great and answered any questions prior to arrival! This beautiful holiday home is just as amazing as the photographs, and then some! All our transactions with Alan were quickly handled from our booking to answering all our questions and needs for our stay. The home has stunning views of Vail Mountain from the large open plan main room. The kitchen is fully stocked and ready to make delicious home cooked meals after a great day of skiing. We parked in Lionshead everyday, but the home is conveniently located near the free shuttle bus down the street. I know you will enjoy this home in any season as much as we did! We will be back for sure! I can’t think of one thing I would change, the place is simply perfect. I wish we could have stayed longer!!! We had a great time! When the coffee maker broke, Alan took care of it right away. We traveled with another family and had 5 kids under 7. We had to drive one mile to Vail. I think that was the only drawback. House was in tip top shape, very clean and comfortable. Highly recommend if you don’t mind driving places. Lauren, thank you for the kind review and glad you enjoyed your stay. In addition to driving, there is a free town of Vail shuttle a short walk from the townhome or your can walk into Town via the Lionshead bridge. We just came back from a great four night stay. Not only was the place lovely with all of the renovations but the place literally had everything imaginable. We have rented homes many times and this place really came fully stocked. Alan was great to work with and very responsive. Ski: Vail Colorado is one of the best and largest ski resorts in North America. Vail boasts three distinct areas of the mountain, each with their own features and fortes, including three terrain parks, seven back bowls and 5,289 acres of freeride terrain. At seven miles wide, finding fresh tracks is as easy as finding elbow room. In fact, on an average day, there are only two skiers per acre, and on a busy day, only four! In the summer, explore Vail Mountain on foot, bike, or horseback. Gondola and select chair lifts run in Summer too.